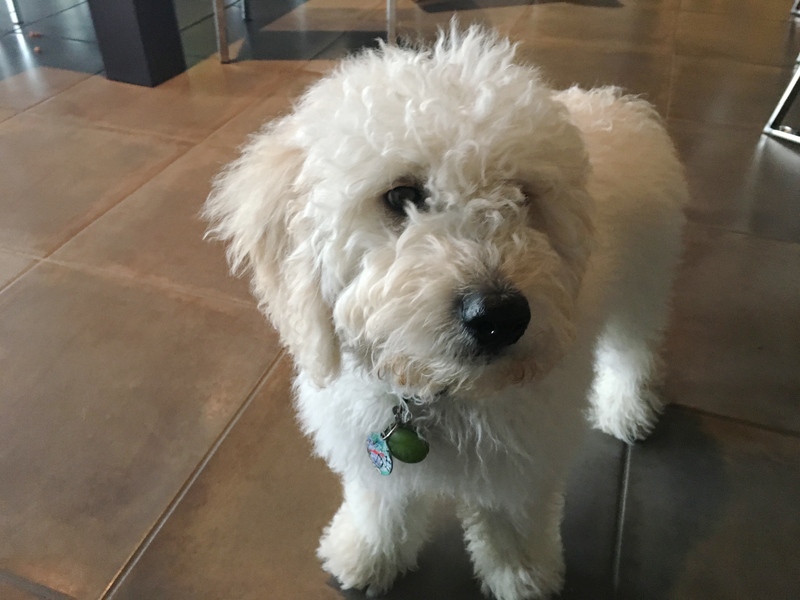 Skye is a three-month-old Goldendoodle puppy. His guardians set up a puppy training session with me to stop his nipping, address his resource guarding, potty training and basic obedience. Skye was a little subdued when I arrived for the session. He came up to investigate me but didn’t do much jumping up or barking. His guardians told me this was better behavior than he normally exhibited. Sometimes dogs with lower confidence will act shy or reserved in new situations. A great way to help dogs or puppies with this problem is to teach them new tricks or commands. I also strongly recommended that the guardians look for socialization opportunities. Getting Skye around other dogs of a similar size, maturity and energy level will help boost his confidence in many areas. I got a firsthand look at some of his rambunctious behavior when the families son arrived home from school. Many puppies get mouthy and nippy when they are overtired. As a puppy trainer, I suggest giving your pup a play break every couple of hours if it’s not doing so on its own. I think a lack of naps may be contributing here. I also recommended that the guardians consider setting up a puppy playpen that is attached to a kennel. This way they have a place that they can put the puppy any time that he starts get overly rambunctious. By putting him in a room and closing the door, we can help the puppy practice being alone for short periods and also influence him to take a nap. Because the puppy play area is gated off, we know that the puppy is safe. You can read about the puppy playpen that I set up for my dalmatian puppy quest by using this link. Because Skye has already started to climb up out of a smaller play pen the family sets up on occasion, they may also need to take a look at this link. I showed the family how they can disagree with Skye’s behavior around of their son, but it was a bit of a challenge. A lot of this is a result of Skye having playful puppy energy and not being very socially experienced. Skye really hadn’t interacted much with other dogs or puppies and mouthing is something other dogs can most effectively communicate to a puppy. Fortunately Skye will start a puppy socialization class tomorrow hosted by myself and a couple of my apprentices. This class should help considerably in terms of Skye’s nipping and playing too roughly. Because he is getting off to a late start, it may be a slower process than if they had started introducing him to other puppies earlier, but he is absolutely young enough to rebound. Another issue that Skye’s guardians wanted to work on was potty training so I spent a couple of minutes going over some basics. By introducing a command word and associating it with the act of elimination and the reward at the right times, we can help Skye learn that there is a benefit to eliminating outside. Potty training is all about repetition, careful observation and rewarding the dog at the right time. Many people mistakenly think that they can punish the dog when it makes a mistake, but in fact this often makes potty training much more difficult as dogs don’t learn when punished for previous actions. I spent a couple of minutes going over some potty training no no’s as well as an additional tip in the following video (Sorry for the back lighting). After we wrapped up the potty training discussion, we moved into the living room so that we could practice having the dog come to us on command. A couple of minutes into this exercise, Skye wandered off on his own. Anytime that a puppy walks away from an exercise that involves treats, it’s a safe bet that it needs to go potty. Fortunately Skye’s guardians recognized the signs and we were able to take him outside and properly reward him for a successful elimination. When we came back inside, we finished with the recall exercise, sort of. The family’s son is a bit of a character which made things a little bit more challenging, lol. He was doing some snacking earlier and Skye was more interested in looking for any food he may have dropped. By sitting in a circle on the floor a few feet away from one another and using hand motions, the command word at the right times and promptly rewarding Skye when he came on command, his family will be able to train their dog to come. I recommended that the family practice this recall exercise several times a day for the next week or so to really instill a solid recall command into their dog. I recommended that they keep these practice session short; 1 to 2 minutes in length. By practicing 3 to 6 times a day with the short practice sessions and naps in-between, it’s easier for the dog to absorb the material which speeds up the learning process. When Skye mouthes the family’s young son or his teeth make any contact with humans, intentional or otherwise, they need to let out a yelp, retract their hand and pause for a second. This is how other dogs communicate a bite was too much. If Skye continues, they should get up and walk away closing the door behind them (only for a minute to ensure he doesn’t get into trouble) or place him in his new play pen for a nap. At this point in the session, the guardians asked me about Skye’s behavior when he had a bone or rawhide. He had been growling when they approached him with one and had started going under the couch to chew it. I pulled out a rawhide so that I could see how Skye reacted when I tried to take it away from him. Usually puppies at this age are simply growling as a reflex when anyone gets near them when they have what they consider a high-value object. But in Skye’s case, this was the beginning of what we refer to as resource guarding. Many people mistakenly think that resource guarding is a sign of aggression. It is not. I have worked with many dogs who are well-trained and very well behaved that still developed a resource guarding habit. I demonstrated how the guardians can practice holding onto an object that they allow Skye to chew on. This will give him the ability to maintain control of the object and mitigate skies resource guarding. The idea is to desensitize the dog to the touch or presence of humans around or near his mouth when he has what he considers to be a high-value item. I recommended that the guardians practice this exercise multiple times a day until they no longer receive a response from Skye. If we caught the resource guarding quickly enough, this structured petting should stop Skye’s guarding behavior. It will be important that they practice this activity several times a day for the next week. Resource guarding can be a scary thing to witness and can be dangerous once a dog matures. If the guardians are not seeing a difference in a week, I asked them to let me know so I can share some additional tips to eliminate this behavior. By the end of the session, Skye seemed to be mellowing out. He was no longer play-attacking or mouthing the families son in a playful way, and was easily redirected when someone came to the door. Many of these unwanted behaviors are things that he will grow out of or learn or unacceptable and puppy socialization class.